Trevor Smyth, second from left, a fourth-year sociology major and captain of RIT’s varsity lacrosse team, said most of the 50 members of his team volunteered. More than 300 Rochester Institute of Technology students, faculty and staff spent part of Giving Tuesday yesterday preparing 50,688 healthy meals for the community during the Giving Tuesday Hunger Project in the Gordon Field House. Giving Tuesday, traditionally held on the Tuesday following Black Friday, encourages people to volunteer and give back to their community. RIT’s Center for Leadership and Civic Engagement selected Feeding Children Everywhere, a Florida-based organization that has donated more than 110 million meals nationwide since 2010, to help bring healthy meals to those in need. 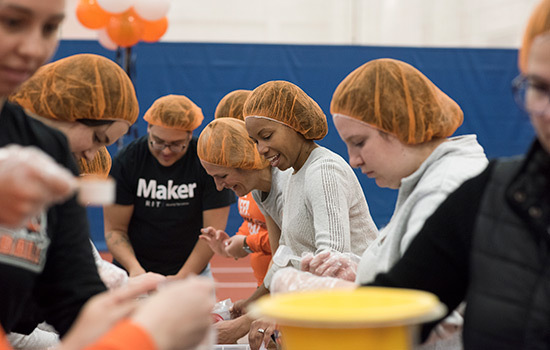 Once packaged, 7,500 boxed meals of red lentil jambalaya, which included lentils, white rice, dehydrated vegetables and pink Himalayan salt, were donated to RIT’s FoodShare program, directly benefiting members of the RIT community. The additional 42,500 meals were donated to Foodlink in Rochester, which will distribute them to agencies operating food pantries and soup kitchens in a 10-county area. Last year, students packaged and donated 20,000 meals on Giving Tuesday. The number was increased to 50,000 this year as part of RIT’s “50 Acts of Kindness” year-long initiative commemorating 50 years on the Henrietta campus. RIT paid for the ingredients for the meals. 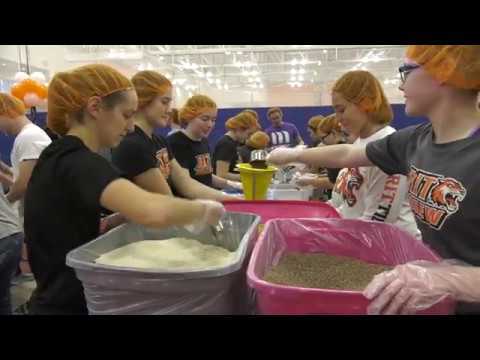 The students, many wearing shirts bearing names of their fraternity, sorority or sports team, donned orange hair nets and took a spot at one of eight long tables, where an assembly line of ingredients would be measured, packaged and boxed. Music from WITR filled the field house as the volunteers worked. At one point during each shift, a competition was held to see who could fill a box of 48 packaged meals the fastest. Maria Lelie, a third-year business management student from Lambertville, N.J., was one of the student leaders of the initiative and helped dish out cooked samples of the jambalaya the students were preparing. Trevor Smyth, a fourth-year sociology major from Orangeville, Ont., is captain of RIT’s varsity lacrosse team. He said most of the 50 members of his team volunteered. “We try to do something every year to give back to the community,” Smyth said. Colton Bailiff, a second-year mobile application development major from Orlando, Fla., was one of five members from Sigma Nu who volunteered. Heather Newton, director of development and community engagement for Foodlink, called the effort “hugely helpful” and said the need for food donations is always the greatest this time of year. If the meals weren’t donated, Foodlink would have to buy more food to accommodate the need for donations. “It’s good to see so many people on Giving Tuesday helping out,” Newton said.